What’s it REALLY like to be a teacher? Have you ever wondered what it’s REALLY like to be an elementary school teacher? Well, here are a couple of my experiences that can tell you a lot. Several times a year, I had to prepare detailed report cards for each student—and my personal life came to a screeching halt — every time. After teaching for a few years, my husband and I decided to have our first child. I already had a number of baby names I’d definitely eliminated — if you catch my drift. I am happy so many of you have contacted me since reading the book to express your delightful comments about the book. Thank you! If you are interested in the book, it is available in paperback and Kindle and on Kindle apps. Here is a link to the book on amazon.com. What? His wife didn’t like him? It is so interesting for adults to see a situation through the eyes of a child. I had lots of fun opportunities to do that when I read my students’ biography reports each year. They read information about their chosen person in encyclopedias and other books–and gathered the information on note cards. Like all teachers, I emphasized that they must not copy material word for word from a book. As a result, their reports had some funny interpretations. Thank you so much for the comments you’ve shared with me about your reactions to my book, I AM SITTING DOWN, TEACHER! I’m happy the book has provided so many laughs for my readers. “Your book has me laughing hilariously! Great job! It brings back a lot of memories from my teaching years!” C.W. “Just finished reading the book. My favorite was a note that you intercepted: “I hate you Jenny…never liked you…never will…you are a dork. Please tear up this note so I won’t get in trouble.” M.M. “I downloaded your book to my Kindle, and I just finished reading it last night. There are so many fun anecdotes in it. Thanks for the wonderful stories!” S.M. One of the most entertaining aspects of teaching kids is reading their reports on various subjects. Here’s a comment one of my fourth graders wrote that makes me laugh every time I think about it. “This book was given to me as a gift and I found it delightful! Elementary teachers will relate to the antics of students in their classrooms and the sweet innocence of children. The author’s sense of humor and her obvious teaching skills are an inspiration.” J.P.
“This was a delight to read. It brought many smiles, quite a few chuckles, and even a tear or two from reading the notes from students. It left me wanting more. Thank you for sharing.” N.B. 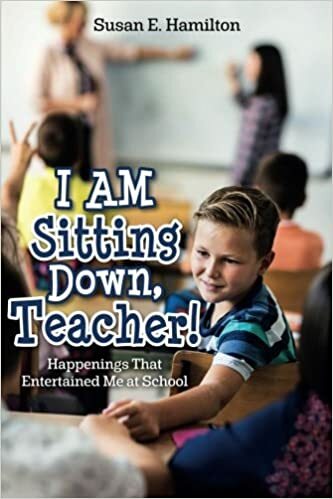 Title of book: I AM Sitting Down, Teacher! If interested in getting a copy of the paperback book or the Kindle version, you probably know it is standard procedure to pay for purchases on amazon.com with a credit card. However, if you are uncomfortable using your credit card online, a different way to pay is to purchase an amazon.com gift card from Fred Meyer or other retailer to buy items on Amazon’s website. Oh, I didn’t bring this gum from home! I will be adding more funny incidents from my book I AM Sitting Down, Teacher! in a blog post once a week. If you are interested in reading the book, it will be available on amazon.com in paperback soon.